Kevin has over ten years of graduate teaching experience in Mental Health and School Counseling programs, and over twenty years of counseling experience working with children, adults and families in private practice, schools, agencies, college counseling, and other therapeutic programs. He earned his doctorate in Counseling, with a concentration in Rehabilitation Leadership, from George Washington University. Kevin is a Licensed Mental Health Counselor; a Permanently Certified School Counselor in New York State; and an Approved Clinical Supervisor. 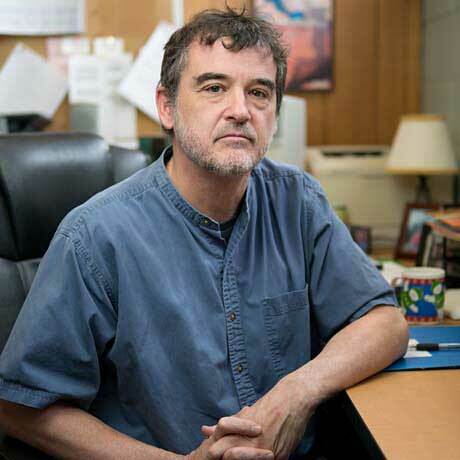 He is the recipient of several awards, including the Joseph Kruson Trust Fund Award for Excellence in Teaching (2012 and 2014), the American Rehabilitation Counseling Association Research Award, and the Association for Specialists in Group Work Emerging Scholar Award. Kevin teaches courses in counseling ethics, family therapy, group work, and substance use disorders. Curtin, K.A., Byrne, J.S. (April, 2016). Bug-in-the-Eye: Using Netbooks for Effective Live Supervision of Counseling Students. 30-minute Roundtable Session presented at the American Counseling Association 2016 Conference and Expo, Montréal, QC, Canada. Curtin, K.A., Byrne, J.S., and Lee, K.R. (October, 2015). Bug-in-the-Eye: Using Netbooks for Inexpensive and Effective Live Supervision of Practicum Students. Presented at the Association of Counselor Education and Supervision 2015 Conference, Philadelphia, PA.
Curtin, K.A. (May, 2014). Preparing high school students with emotional disabilities for successful transitions to postsecondary employment and education. Presented at the New York State Career Development Association Statewide Conference, Buffalo, NY. Curtin, K.A. (May, 2014). Substance use among adolescent girls. Workshop presented at Alfred State College’s Women are Stronger conference, Alfred, NY. Eacho, T. C., Curtin, K.A., Sachdev, N., Lindstrom-Johnson, S., and Bradshaw, C. (October, 2013). Improving School Climate to Prevent Violence in At-Risk Youth. Presented at the 18th Annual Conference for Advancing School Mental Health, Crystal City, VA.
Curtin, K. A. and Eacho, T. C. (October, 2012). The Glass is Half-Full: Investigating the Factors of Resiliency among Exceptional Youth Living in Underserved Communities. Presented at the 17th Annual Conference for Advancing School Mental Health, Salt Lake City, UT. Curtin, K. A. and Schweitzer, A. (April, 2012). Turning crises into opportunities for insight and change: The use of crisis counseling in mental health settings. Workshop accepted at the New York Mental Health Counselors Association 2012 Convention, Albany, NY. Brandow, J., Loud, H., Wagner, A., Benedetto, J., Keeley, P., and Curtin, K. A. (March, 2012). Investigating the Factors of Resiliency among Exceptional Youth Living in Rural Poverty. Poster presented at the American Counseling Association Annual Conference, San Francisco, CA. Curtin, K. A. (February, 2012). The Social Climate of Multifamily Therapy Groups in a Special Education Program. Presented at the Association for Specialists in Group Work, 2012 National Convention, Albuquerque, NM. Curtin, K. A. and Eacho, T. C. (September, 2011). Evaluating the effectiveness of Multifamily Therapy Groups: Members' perspectives on the essential elements. Poster presented at the 16th Annual Conference for Advancing School Mental Health, Charleston, SC. Curtin, K. A. (November, 2010). Counseling resistant adolescents. Presented at the International Child and Adolescent Conference XV, Minneapolis, MN. Curtin, K.A. (April, 2010). Improving employee-readiness for adolescents with emotional and behavioral disorders: A quasi-experimental study. Presented at the Council for Exceptional Children’s 2010 Convention and Expo, Nashville, TN. Curtin, K.A. (March, 2010). Utilizing work-based learning activities in the development of employability skills for adolescents with mental illness. Poster presented at the American Counseling Association Annual Conference & Exposition, Pittsburgh, PA.
Curtin, K.A. (March, 2010). The therapeutic community: Not just for addiction, not just for residential. Poster presented at the American Counseling Association Annual Conference and Exposition, Pittsburgh, PA.
Curtin, K.A. (December, 2009). Classroom management strategies: Lessons from special education. Invited lecture: 2009-10 Lecture Series, Department of Education Reform, University of Arkansas, Fayetteville, AR. Curtin, K. A., Schweitzer, A., Tuxbury, K., and D’Aoust, J. A. (2016). Investigating the factors of resiliency among exceptional youth living in rural underserved communities. Rural Special Education Quarterly, 35, 3-9. Curtin, K. A. (2015). Bug-in-the-Eye Group Supervision for the Development of Facilitation Skills in Psychoeducational Groups. In M. Luke & K. Goodrich (Eds. ), Group Experts Share their Favorite Activities for Supervision (Vol. 2, pp. 126-131). Alexandria, VA: Association for Specialists in Group Work. Curtin, K.A. and Eacho, C (2012). Dimensions of social climate as predictors of satisfaction with Multifamily Therapy Groups. Group, 36, 283-301. Curtin, K. A. and Garcia, J. (2011). Improving work performance for adolescents with emotional and behavioral disorders: A comparison of two work-based learning interventions. Journal of Rehabilitation, 77, 31-39. Curtin, K. A. (2010). Developing a therapeutic community for students with emotional disturbance: Guidelines for practice. Journal of Therapeutic Schools and Programs 4, 134-146. Curtin, K. A. (1996). Similarities between Rousseau’s discourse on The Origins of Inequality Among Men and concepts in person-centered counseling. The Person- Centered Journal, 3, 15-21. Curtin, K. A. (1996). Adolescent egocentrism and its relationship to HIV and AIDS. The Journal for the Professional Counselor, 11, 31-40.